Sgt. Robert Pauole, second from right, stands in support with other traffic commanders statewide as Gov. 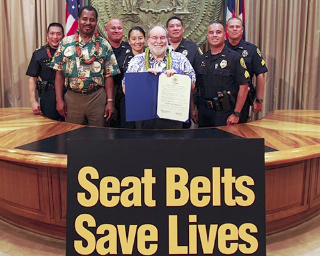 Neil Abercrombie issues a proclamation to launch the annual “Click It or Ticket” campaign. 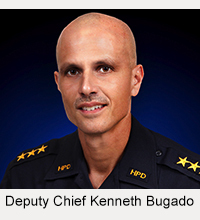 Hawaiʻi Island police are informing the public that the National “Click It or Ticket” campaign runs from May 20 through June 2. During this period, police will increase islandwide enforcement of seat belt and child restraint laws. To kick off the campaign, Governor Neil Abercrombie on Monday (May 20) signed into law a requirement that all occupants in a vehicle be restrained. The law took effect immediately upon his signature. Under the new law, the driver now is responsible for all other occupants of the vehicle. If the driver is stopped and any passenger is not using a seat belt—whether in the front seat or back seat— the driver will be the one cited. 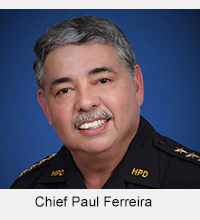 The Hawaiʻi Police Department began the “Click It or Ticket” campaign in Hilo on Monday with sign waving on Kamehameha Avenue to draw attention to the importance of using seat belts and child restraints.